Dmitri Samorukov (Edmonton Oilers), Alexander Alexeyev (Washington Capitals), Grigori Denisenko (Florida Panthers) and Vitali Kravtsov (New York Rangers) each had a goal and an assist to help Russia defeat Switzerland 7-4 in preliminary round Group A action at the IIHF World Junior Championship at Rogers Arena in Vancouver on Sunday. Forward Kirill Slepets, who is eligible for the 2019 NHL Draft, put Russia ahead 4-3 with a shorthanded 2:04 into the third period. Kirill Marchenko (Columbus Blue Jackets) and Pavel Shen (Boston Bruins) also scored for Russia (3-0-0-0), which plays Canada (3-0-0-0) for the top spot in Group A on Monday. Danil Tarasov (Blue Jackets) made 27 saves for Russia, including two penalty shots awarded on the same play with 3:05 left in the second period and the game tied 3-3. 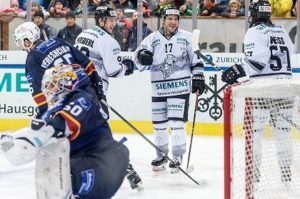 Marco Lehmann scored twice, and Valentin Nussbaumer and Yannick Bruschweiler each had a goal and an assist for Switzerland (1-0-1-2), which failed to protect 2-0 and 3-1 leads. Akira Schmid (New Jersey Devils) made 34 saves for Switzerland. Andrej Kollar scored a hat trick in Slovakia’s 11-2 win against Kazakhstan in a Group B preliminary-round game at Save-On-Foods Memorial Centre in Victoria, British Columbia. Adam Ruzicka (Calgary Flames) had two goals and an assist, Marcel Dlugos scored two goals, Adam Liska, Milos Roman (Flames), Filip Krivosik and Pavol Regenda each had a goal and an assist, and Samuel Hlavaj made 15 saves for Slovakia (1-0-0-2). Artur Gatiyatov scored two goals for Kazakhstan (0-0-0-3). Another historic day for sports in Pakistan and a great initiative heralding the beginning of new era in Pakistan’s sports world. 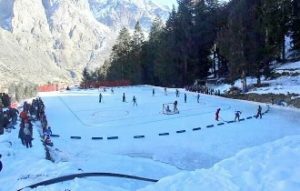 History was made as the first ever ice hockey match was played at PAF Ski Resort, Naltar Valley on December 29th. 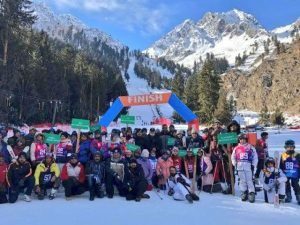 This first ever ice hockey took place between the Ice Hockey teams of Pakistan Air Force (PAF) and Gilgit-Baltistan Scouts. There was a fine display of extraordinary ski and hockey skills from the players of both the teams. Due to that none of the team was able to score a goal in the match duration. However, the winner of the match was decided through penalty shootouts. PAF won the match with the only goal from Shah Siyar. Though ice hockey sport is included in the list of the world’s modern games. The history of ice hockey in Gilgit Baltistan region can be related to a local game “Ghatal”, which is also played with two sticks and a ball. Hope this sports will flourish in Pakistan in coming years and people will get to enjoy Ice Hockey sport on larger scale. 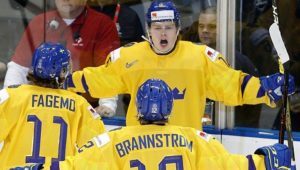 Adam Boqvist scored with 1:09 remaining in overtime, and Sweden overcame blowing a four-goal lead in the third period for a 5-4 win against the United States in Group B at the 2019 IIHF World Junior Championship at Save-On-Foods Memorial Centre in Victoria, British Columbia on Saturday. Boqvist (Chicago Blackhawks) scored from the left circle off a pass from Jacob Olofsson (Montreal Canadiens). The United States (2-0-1-0) scored four unanswered goals in a span of 7:07 of the third period to tie the game 4-4. Michael Anderson, the U.S. captain, started the rally with a power-play goal at 9:34 to make it 4-1 before Ryan Poehling (Canadiens) had a natural hat trick. He scored a power-play goal at 13:25 to cut it to 4-2, scored with the goalie pulled for an extra attacker at 19:23 to make it 4-3, and tied it 4-4 off a turnover at 19:36. “We were being more direct towards the net,” Poehling said. “After the first two periods we had 11 shots so for us to rebound as we did (with 16 shots in the third period) we minimized our turnovers in the neutral zone a lot more and that helped out too. 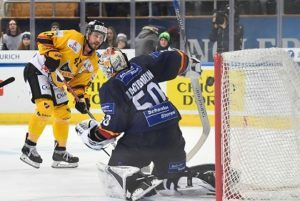 Emil Bemstrom (Columbus Blue Jackets), Filip Westerlund (Arizona Coyotes), Rickard Hugg and Erik Brannstrom (Vegas Golden Knights) scored, and Samuel Ersson made 24 saves for Sweden (2-1-0-0). The U.S. was without center Jack Hughes for a second straight game because of an undisclosed injury. Hughes is projected as the No. 1 selection in the 2019 NHL Draft. Westerlund scored on a one-timer from the right circle to give Sweden a 1-0 lead 4:47 into the first period. Hugg made it 2-0 when he knocked in a puck from the slot 9:21 into the second, and Bemstrom took advantage of a turnover at 12:39 for a 3-0 lead. Brannstrom scored his team-leading fourth goal 2:33 into the third for a 4-0 lead. The win gives Sweden 47 straight victories in preliminary-round play. Sweden’s last loss was 3-2 in overtime against the United States on Dec. 31, 2006. The Swedes have outscored the opposition 241-80 during the streak, which includes 41 wins in regulation, two in overtime and four in a shootout. Max Comtois (Anaheim Ducks), Brett Leason and Alexis Lafreniere scored in the first period to help Canada to a 5-1 victory against the Czech Republic in Group A at Rogers Arena in Vancouver on Saturday. MacKenzie Entwistle (Chicago Blackhawks) and Morgan Frost (Philadelphia Flyers) also scored, and Michael DiPietro (Vancouver Canucks) made 23 saves for Canada (3-0-0-0), which leads the group. Canada got one goal from its top line and two from the fourth line. Ondrej Machala, who is eligible for the 2019 NHL Draft, scored for the Czech Republic (0-1-0-2), which is fourth in Group A. Jiri Patera (Vegas Golden Knights) stopped 16 of 20 shots before being pulled after two periods. Jakub Skarek (New York Islanders) made nine saves in relief. 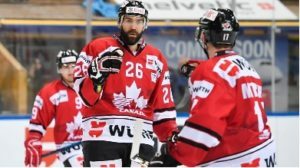 Canada scored 14 goals in a win against Denmark on Wednesday and defeated Switzerland 3-2 on Thursday. The victory against the Czech Republic had a bit of both games. Comtois, Canada’s only returning player from the 2018 gold-medal-winning team, made it 1-0 at 6:03 of the first period after a blind back pass from Owen Tippett (Florida Panthers). Machala, 19, tied it 1-1 on a 2-on-1 at 6:40, but Leason gave Canada a 2-1 lead on a power play at 11:32. Leason, 19, was passed over the past two drafts but is a B-rated skater for the 2019 draft by NHL Central Scouting in its November players to watch list. Lafreniere, the first 17-year-old since Connor McDavid in 2015 to play for Canada, made it 3-1 with a one-timer from the left face-off dot at 16:39. Entwistle scored for a third straight game to make it 4-1 at 14:41 of the second period, and Frost scored his fourth goal on a power play for a 5-1 lead at 9:01 of the third. Frost also had an assist and leads the tournament with seven points. 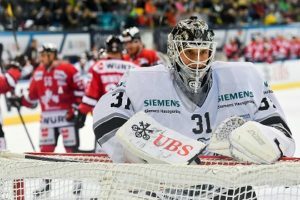 Philipp Kurashev (Chicago Blackhawks) had a hat trick, and Luca Hollenstein made 21 saves to help Switzerland advance to the quarterfinals with a 4-0 win against Denmark in Group A at Rogers Arena. 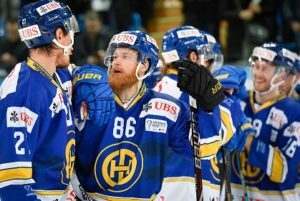 Simon Le Coultre, an undrafted defenseman, also scored for Switzerland (1-0-1-1). Kurashev, selected in the fourth round (No. 120) of the 2018 NHL Draft, scored twice in the first period and completed his hat trick with a solo effort 1:38 into the third period. Mads Sogaard, a 6-foot-7, B-rated goalie on NHL Central Scouting’s Players to Watch list for the 2019 NHL Draft, made 22 saves. Denmark (0-0-0-3) hasn’t scored a goal and will play a three-game relegation series to stay in the top group for the 2020 WJC. Defensemen Henri Jokiharju (Chicago Blackhawks) and Ville Heinola, a B-rated skater in NHL Central Scouting’s Players to Watch list for the 2019 NHL Draft, each had a goal and an assist to help Finland to a 5-1 win against Slovakia in Group B at Save-On-Foods Memorial Centre. Santeri Virtanen (Winnipeg Jets), Anton Lundell (2020 NHL Draft eligible), and Oskari Laaksonen (Buffalo Sabres) scored, Eeli Tolvanen (Nashville Predators) had two assists, and Ukko-Pekka Luukkonen (Sabres) made 22 saves for Finland (2-0-0-1). Milos Roman (Calgary Flames) scored, and Samuel Hlavaj, a B-rated goalie in NHL Central Scouting’s Players to Watch list, made 31 saves for Slovakia (0-0-0-3). Jokiharju gave Finland a 1-0 lead with a one-timer from the left circle on a 5-on-3 power play 12:24 into the first period. Virtanen made it 2-0 on a backhand at 16:43. Heinola scored on a snap shot from the left circle to increase the lead to 3-0 2:02 into the second period before Lundell made it 4-0 at 13:53. Roman scored a 5-on-3 power-play goal at 16:26 to bring Slovakia within 4-1. Laaksonen gave Sweden a 5-1 lead 13:01 into the third period. Cory Kane(C) of Kunlun Red Star competes during the Kontinental Hockey League (KHL) game between Kunlun Red Star and Helsinki Jokerit, in Helsinki, Finland, on Jan 11, 2018. Ice hockey’s world governing body has urged China to justify its automatic qualification for the 2022 Winter Olympics. Last May, the International Ice Hockey Federation (IIHF) voted to allow China to enter its men’s and women’s teams in the Beijing 2022 tournaments, breaking with the convention of making the host nation qualify through competition. However, some observers have expressed concerns that the current poor standard of the Chinese squads could dilute the quality of the Games. “It’s a challenging situation for China, especially in the men’s game,” IIHF President Rene Fasel told China Daily in Shanghai at the recent launch of the fifth mass ice and snow sports carnival. “It takes as long as 15 years to develop good hockey players to be competitive at the highest level－at the moment, China has only four. Unlike most team sports at Summer Olympics where hosts are awarded automatic entries, the 12-team men’s and 10-squad women’s hockey Olympic tournaments traditionally require all nations to go through a challenging qualification system. Without enough talent to sustain a national league, China’s 33rd-ranked men’s team has never previously reached the Games or the world championships’ top division. China’s women’s team enjoyed a short-lived purple patch during which it reached the 1998 Olympic semifinals in Nagano, Japan. However, since its last Games appearance in 2010 in Vancouver, the 20th-ranked female squad has suffered a sharp decline and has seen its funding cut. Fasel, though, is backing China to prove the doubters wrong in four years’ time. “I don’t know if you have the word ‘impossible’ in Chinese. I don’t think so. The Chinese character is that when you want something you will do it by working day and night, putting in extra effort and manpower until you make it happen,” said the 68-year-old Swiss. The Chinese Ice Hockey Association managed to persuade the IIHF to grant the Olympic spots by promising to build a domestic professional league that would sustain the sport’s development here after the Games. The association, which separated from the State-run sports system last year, pledged in a recent report that the new national league would begin in May 2019 and feature eight clubs. “Increasing the number of games homegrown talents play is critical, because in the past they’ve had a minimal amount of tests,” said CIHA president Cao Weidong. 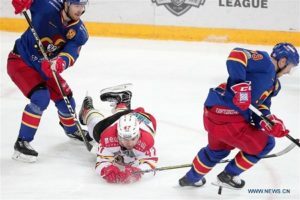 The new league is expected to be made up of teams from four major clubs－Kunlun Red Star, Jilin City Investment, Beijing Shougang and Zhongshang Hokay－and squads developed by northeastern provincial sports bureaus. “We want to have the Chinese preparing the two national teams (for 2022) and at the same time to build their leagues so we can guarantee the sport’s legacy and be sustainable after the Olympics,” said Fasel. The new league, Fasel hopes, will form the top of a pyramid which can be built on the foundations of a growing grassroots game－the popularity of which is highlighted by the 2,600 junior players registered for the Beijing Minor Hockey League’s 2018-19 season. 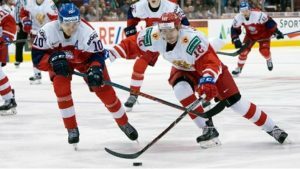 China’s pro hockey scene is currently limited to Shanghai-based Kunlun Red Star’s participation in the Russia-based Kontinental Hockey League, two entries in the rebranded Silk Road Hockey League (formerly Russia’s second tier) and Red Star’s Shenzhen-based female squad playing in the Canadian Women’s Hockey League. The teams all feature overseas talent of Chinese ancestry drafted through 2022 Olympic tryouts. The aim is to have them eligible to represent China in time for the Games. South Korea controversially naturalized six Canadian male players prior to the 2018 Pyeongchang Olympics. However, Fasel says China’s plans are easier to accept. “It’s a good step that China only wants players with Chinese heritage. A gap (in development) of at least 15 years cannot be closed anytime soon, so it’s necessary to use these groups of talent,” he said. Joel Farabee (Philadelphia Flyers) scored a natural hat trick in the first period to help the United States defeat Kazakhstan 8-2 in Group B at the 2019 IIHF World Junior Championship at Save-On-Foods Memorial Centre on Friday. United States center Jack Hughes, the consensus No. 1 pick in the 2019 NHL Draft, was a surprise scratch because of an undisclosed injury and is day to day. The U.S. didn’t need him, outshooting Kazakhstan 66-13. Ryan Poehling (Montreal Canadiens) stepped into Hughes spot on the top line and scored a shorthanded goal and had two assists. Oliver Wahlstrom (New York Islanders), Alexander Chmelevski (San Jose Sharks), Tyler Madden (Vancouver Canucks) and Josh Norris (Ottawa Senators) each scored, and Jason Robertson (Dallas Stars) had four assists for the United States (2-0-0-0). Cayden Primeau (Canadiens) made 11 saves. Forwards Dmitriy Mitenkov and Andrei Buyalskiy, who are each eligible for the 2019 draft, scored for Kazakhstan (0-0-0-2). Goalie Vladislav Nurek started, but was replaced after two goals by Demid Yeremeyev, who stopped 19 of 24 shots before being replaced by Nurek, who finished with 41 saves. Wahlstrom gave the U.S. a 1-0 lead 1:37 into the first period, but Buyalskiy tied it 18 seconds later before Farabee, who was selected by the Flyers with the No. 14 pick in the 2018 NHL Draft, took over. The 18-year-old left wing scored his first goal on a power play at 5:15, got his second off the rush at 8:53, and finished off the hat trick after being left alone in front at 12:05. Robertson assisted on all three Farabee goals. The United States plays Sweden (2-0-0-0) on Saturday. Sweden has won 46 consecutive preliminary-round games at the WJC. Artyom Galimov and Nikolai Kovalenko (Colorado Avalanche) each scored shorthanded, and Russia defeated the Czech Republic 2-1 in Group A at Rogers Arena. Pyotr Kochetkov, an undrafted 19-year-old goalie eligible for the 2019 NHL Draft, made 24 saves for Russia, which opened with a 4-0 win against Denmark on Thursday. Jachym Kondelik (Nashville Predators) scored a power-play goal, and Lukas Dostal (Anaheim Ducks) made 26 saves for the Czech Republic, which opened with a 2-1 overtime win against Switzerland on Wednesday. Galimov, a 19-year-old still eligible for the 2019 NHL Draft, made it 1-0 at 17:05 of the first period with a solo rush, cutting left across the slot and beating Dostal with a wrist shot the other way. Kovalenko, selected in the sixth round (No. 171) in the 2018 NHL Draft, finished off a shorthanded 2-on-1 pass from Pavel Shen (Boston Bruins) to make it 2-0 at 14:57 of the second period. Kondelik, selected in the fourth round (No. 111) in the 2018 draft, scored 53 seconds later on the same power play to bring the Czech Republic within 2-1 when a point shot bounced off his face, up and over Kochetkov, and into the net. 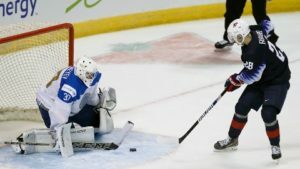 Cody Glass (Vegas Golden Knights), MacKenzie Entwhistle (Chicago Blackhawks) and Noah Dobson (New York Islanders) each scored, and Ian Scott (Toronto Maple Leafs) made 15 saves to help Canada to a 3-2 win against Switzerland in Group A at the 2019 IIHF World Junior Championship at Rogers Arena on Thursday. 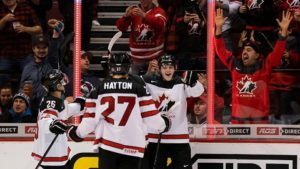 Canada is 2-0-0-0 and has outscored its opposition 17-2. 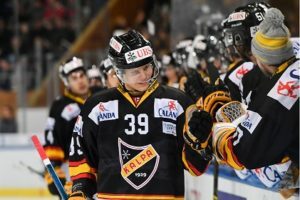 Philipp Kurashev (Blackhawks) scored twice and Akira Schmid (New Jersey Devils) made 29 saves for Switzerland (0-0-1-1), which opened with a 2-1 overtime loss to the Czech Republic on Wednesday. Canada, which opened with a 14-0 win against Denmark, went up 1-0 on Switzerland on the first shift when Glass, picked No. 6 in the 2017 NHL Draft, scored 36 seconds into the first period. Switzerland settled in, and Kurashev, a fourth-round pick (No. 120) in the 2018 NHL Draft, tied it 1-1 with a power play one-timer 46 seconds into the second period. Scott made a great glove save off Swiss forward Yannick Bruschweiler alone in the slot at 4:52. Entwhistle, a third-round pick (No. 69) in 2017, put Canada ahead for good at 5:55, converting a pass from Shane Bowers (Colorado Avalanche) to make it 2-1. Dobson, a defenseman picked No. 12 in the 2018 draft, made it 3-1 at 12:08 of the second period. Kurashev scored his second power-play goal of the tournament with 1:49 left, and Schmid pulled for an extra attacker, to make it 3-2. Canada plays the Czech Republic on Saturday (8 p.m. ET; NHLN, TSN). Switzerland plays Denmark on Saturday (4 p.m. ET; NHLN, TSN). Kaapo Kakko, an A-rated skater in NHL Central Scouting’s Players to Watch list for the 2019 NHL Draft, scored his first goal of the tournament to help Finland to a 5-0 win against Kazakhstan in Group B at Save-On-Foods Memorial Centre. Otto Latvala (2019 NHL Draft), Aarne Talvitie (New Jersey Devils), Samuli Vainionpaa, and Aleksi Heponiemi (Florida Panthers) also scored and Filip Lindberg made 18 saves for Finland (1-0-1-0). Latvala gave Finland a 1-0 lead off a wrist shot from the left circle 12:52 into the first period before Talvitie extended the lead 2:16 later with an unassisted goal off a turnover. Vainionpaa scored 12:49 into the second to give Finland a 3-0 lead. Kakko, a projected top-5 pick in the 2019 draft, gave Finland a 4-0 lead 7:17 into the third period and Heponiemi made it 5-0 at 9:13. Demid Yeremeyev made 51 saves for Kazakhstan (0-0-1-0). Finland plays Slovakia on Saturday (6:30 p.m. ET); Kazakhstan will play the United States on Friday (10:30 p.m. ET; NHLN, TSN). Alexander Romanov (Montreal Canadiens) had a goal and two assists, Danil Tarasov (Columbus Blue Jackets) made 21 saves, and Russia opened its tournament with a 4-0 win against Denmark in Group A at Rogers Arena on Thursday. 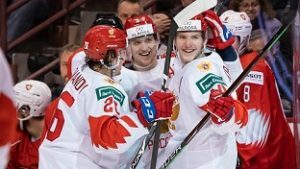 Vitali Kravtsov (New York Rangers), Pavel Shen (Boston Bruins) and Ivan Morozov (Vegas Golden Knights) scored for Russia, which was outshot 21-20. Goalie William Rorth started for Denmark after replacing Mads Sogaard in the third period of a 14-0 loss to Canada on Wednesday. Rorth, who gave up three goals on four shots against Canada, made 16 saves. Kravtsov, the No. 9 pick in the 2018 NHL Draft, made it 1-0 at 6:28 of the first period after a three-way passing play on the power play. Romanov, a defenseman picked in the second round (No. 38) of the 2018 draft, made it 2-0 with 2:10 left in the second period with a screened shot from the top of the left face-off circle. The 18-year-old, who does not have a point in 28 Kontinental Hockey League games with CSKA, assisted two goals in the third period. Shen, a seventh-round pick (No. 212) pick in the 2018 draft, scored at 13:56 to make it 3-0, and Morozov, picked in the second round (No. 61) in the 2018 draft, scored into an empty net with 1:25 left to make it 4-0. Emil Bemstrom scored two goals to help lead Sweden to a 5-2 victory against Slovakia at Save-On-Foods Memorial Centre in Group B on Thursday. The win gives Sweden 46 straight victories in preliminary-round play at the World Junior Championship. Sweden’s last loss was 3-2, in overtime, against the United States on Dec. 31, 2006. Lucas Elvenes (Vegas Golden Knights) and Isac Lundestrom (Anaheim Ducks) each had a goal and an assist, and Erik Brannstrom (Golden Knights) scored for Sweden (2-0-0-0). Elvenes opened the scoring at 11:42 of the first period. Bemstrom (Columbus Blue Jackets) scored his first goal at 16:12 of the first period to give Sweden a 2-1 lead. He scored a power-play goal 6:40 into the second period for a 3-1 lead. Brannstrom scored his third power-play goal in two tournament games to give Sweden a 4-1 lead 5:09 into the third period. Sweden’s final goal at 12:37 of the third. Adam Liska, who tied the game at 1-1 at 13:43 of the first and Milos Fafrak scored for Slovakia (0-0-2-0). Farfak’s goal at 8:42 of the third made it 4-2. Sweden plays the United States at Save-On-Foods Memorial Centre on Saturday (10:30 p.m. ET; NHLN, TSN). Slovakia plays Finland on Saturday (6:30 p.m. ET).